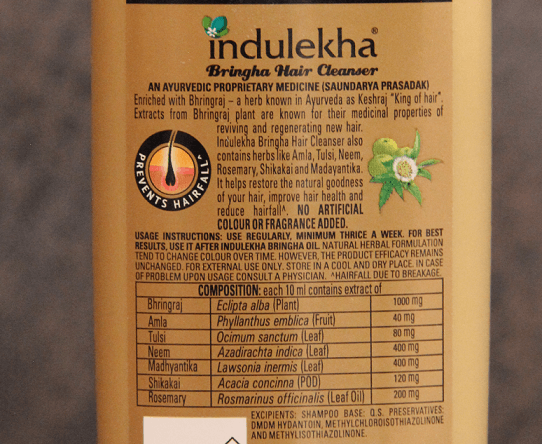 Containing a blend of powerful herbs, the Indulekha hair cleanser is a great ayurvedic cleanser. After over 8 weeks of regular use, I’d say it helps get rid of impurities and keep your scalp clean, promoting good scalp condition for new hair follicles to grow from. Yet, I am not sure how effective it really is when it comes to controlling dandruff and growth of new hair. If you’re looking for an alternative shampoo that may bring good results over time, you might want to consider buying a 10 in 1 shampoo with active ingredients known for repairing damaged hair and strengthening it from its roots. As always, bear in mind that there is a lot of hair shampoos out there: both good and bad. No matter what you pick, read through the ingredients and determine whether it will work for your type of hair. What is the Indulekha bringha cleanser? Does it really help prevent hair loss? Does it justify the bold claims made by the manufacturer? If so, how does it help with your hair fall? Read through this review to find out. Having suffered hair loss myself, I often keep an eye out for natural shampoos and conditioners because they are usually free from harsh chemicals and enriched with nourishing properties that help keep hair clean and well-conditioned and control hair fall to an extent. One product that got me excited was the Indulekha cleanser. What is the Indulekha bringha cleanser? Does it really help prevent hair loss? Does it justify the bold claims made by the manufacturer? There has to be a method to the madness. If so, how does it help with your hair fall? If you have been searching for Ayurvedic hair loss products in India there’s a good chance you might have come across Indulekha. For those who don’t know, Indulekha is a popular beauty and personal care brand selling a range of hair care products containing a special Ayurvedic formula. Indulekha bringha oil is particularly popular. Hindustan Unilever bought this South Indian brand a couple of years ago so that they could build it into a bigger brand and replicate its success all over the country. After taking over the brand, they have taken things to the next level and made Indulekha a successful brand. 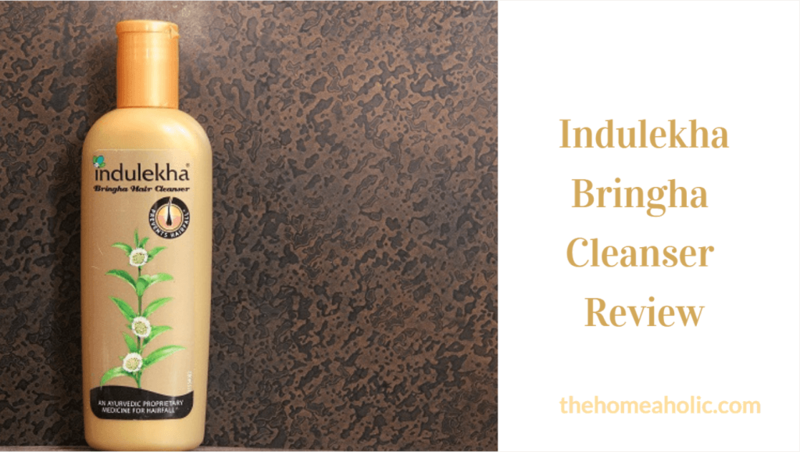 Riding on the popularity of the bringha hair oil, they have now launched another exciting new product under the Indulekha label- the bringha hair cleanser. While a cleanser seems to be a great addition to their product range, the company has definitely not helped itself, making tall claims that the cleanser’s special Ayurvedic formula can prevent hair loss. That begs the question: can using an Ayurvedic shampoo three times a week prevent hair loss, or, better yet, stop it completely? Of course, me being me, I decided to test out the cleanser to see what the hype was about. 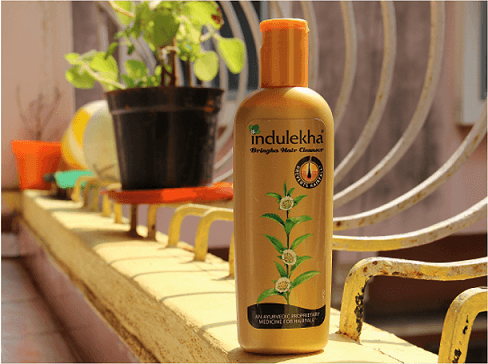 In the following sections, I am going to give you a review of the Indulekha hair fall shampoo- complete with details on what it is, what it contains, how it works and who it is for etc. Many of us tend to assume things about products that we are keen on buying and it is very normal to miss certain things. But a little research goes a long way towards setting your expectations straight. Well, I say this because I thought this cleanser was just another ayurvedic shampoo in the market with a special formula that can do two things- prevent hair loss and help with hair regrowth. I was wrong. But it didn’t take me more than 5 minutes to go from ‘misinformed’ to ‘informed’. I flipped the bottle over and read through the fine print on the back. And it changed my perception. I noticed that there was a wide gap between what I expected this cleanser would do and what it could actually do. So this is what it says. 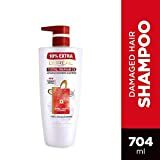 It is a hair fall shampoo with a special ayurvedic formula to reduce hair loss caused by breakage (not baldness though), resulting in hair that looks thicker and feels fuller. In other words, the makers clearly state that using this cleanser as prescribed might reduce hair loss caused by breakage and not baldness or any other similar causes of hair fall. But I had a different view about what it can do. Assuming that it can stop all kinds of hair loss, I thought the makers have gone a little overboard with their promotion. In fact, the above claim is not too unbelievable after all. Cleansers like this, usually, provide a deep cleansing action to your scalp, washing away dirt, grime and other free particles that cling on to your hair and clog your scalp, causing hair fall. 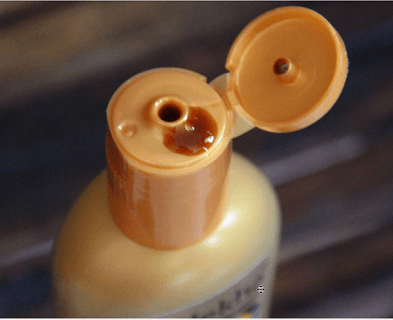 So, when you pick up this cleanser shampoo bottle from your local store or buy it online, make sure you know what to expect in terms of the results you get from using it. And that helps every bit. 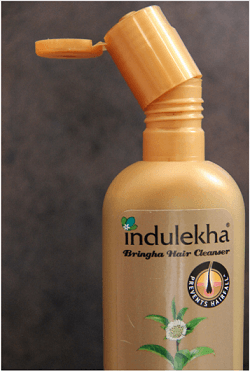 What is the Indulekha Bringha Hair Cleanser? Indulekha Hair Cleanser is not a shampoo. I combed through the description on the label and there was only one mention of the word ‘shampoo’. Nah, it is not a conditioner either. It is an ayurvedic medicine for hair fall. Referred to as ‘Saundarya Prasadhak’, the Bringha Hair Cleanser is a proprietary ayurvedic medicine containing special herbal ingredients known for their ability to do restore the natural goodness of hair, improve overall hair health, and decrease hair fall. Like its cousin, the Indulekha cleanser has Bhringraj as its staple ingredient. Known as “King of Hair” in Ayurvedic circles, Bhringraj is known to possess strong medicinal properties that work on dry, damaged hair, giving it a new lease of life and making it healthier. The cleanser also has other herbal ingredients including Amla, Tulsi, Neem, Shikakai, Rosemary, and Madhyantika. I looked up each of the ingredients and made a table below with the list of herbs, their benefits etc. Bringharaj Bringha, Maka Eclipta alba Whole Plant Known to be more effective than minoxidil in promoting hair growth, bringha oil arrests excessive hair fall and prevents premature greying. Thanks to its excellent cooling properties, this herb also keeps your scalp cool, removes stress, and helps treat alopecia. Tulsi Tulsi Ocimum sanctum Leaf Has great anti-fungal, anti-bacterial and anti-inflammatory properties, promoting effective hair and scalp care. Neem Neem Azadirachta indica Leaf Has great anti-fungal, anti-bacterial and anti-inflammatory properties, promoting effective hair and scalp care. Shikakai Shikakai Acacia concinna Pod An inevitable part of traditional Indian hair care , it makes hair stronger from the roots, controls dandruff and cleanses scalp thoroughly. Rosemary Rosemary Rosmarinus officinalis Leaf Oil Known for its therapeutic properties, Rosemary oil deep cleanses your scalp stopping/preventing scalp related issues. This cleanser is for anybody who wants to take good care of their hair. I know that is a very broad statement, but it is what it is. 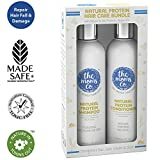 The label lacks information on what type of hair this cleanser works best on, and what sort of hair problems this product is meant to fix, etc. 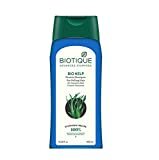 Overall, it doesn’t seem to be a special product meant to cure one or all of the hair problems such as dandruff, breakage, split ends, greying, baldness etc. That is not to say it doesn’t work. Just think of it as a general-purpose cleanser for washing your hair and keeping it clean. If any of the above problems concerns you and you are looking to try this cleanser, I may not be able to give you any specific pointers. Personally, I like to think that I have average, curly dry hair that needs shampooing every now and then. It suits me just fine and has helped reduce hair fall. Woodish brown in color, just like the bringha oil, the cleanser has a similar aroma, though not as strong. As for consistency, it’s neither too thick nor watery. It’s right there about in the middle- and that’s a good thing. One thing worth noting though is that this cleanser lathers. It lathers really well. While that may seem uncharacteristic of an all-natural solution prepared only with herbal ingredients, the shampoo base of this cleanser is free from harsh agents such as sulfate, paraben and other chemicals. Give this shampoo a try if you are looking for a genuine sulfate and paraben free shampoo. Unlike Indulekha bringha oil, which comes in a selfie bottle with a strange attachment on top, this cleanser bottle features a simple design and is pretty simple to use. Remember, you need to cleanse your hair properly. Don’t hurry. Take your time and make sure you rinse any cleanser out . Here’s a good shampooing routine to start with. Detangle your hair with a quality brush before cleansing. Start at the end and work your way up the roots. Detangling your hair after shampooing, when it is wet and heavy, is not ideal. Apply a good nourishing oil to the ends of strands and brush them to disperse oil evenly. The maker recommends using Indulekha hair oil for best results. Leave it on your hair for at least 20 minutes or so. I am not a big fan of conditioners so I’d like to leave it on for as long as possible. Take a small amount of the cleanser and emulsify it with water. Once it has foamed, use your fingertips to lather just the roots in a gentle circular motion. Rinse your hair thoroughly. It takes time, but it’s okay. Rinse it all out until your hair is very clean. If your shower is incomplete without conditioning, apply a tiny bit of conditioner from midshaft to the ends. Don’t dry your hair by rubbing it with a towel. Hang your head down and flick a towel over it from the top and bottom to dry your hair and to remove excess water. This is a lengthy procedure and takes more time than usual, but when done correctly, this method can give you good results. You should not be using this shampoo more than thrice a week. Well, you may be wondering what to shampoo with for the other days. Even though dry shampoo is something to consider, leading hair experts suggest that using a few drops of a good apple cider vinegar solution would definitely help remove excess oil from hair, improving overall scalp health. I’ve been using the cleanser for five weeks now, and I must say I like what it is doing. 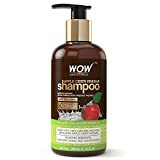 I like how it provides a great cleansing action without actually stripping away natural oils from my hair, and I could really feel the difference in the texture of my hair after showering with it. I used it yesterday and it left my hair clean and soft with a mild note of herbal perfume- which I really don’t mind at all. After I finished drying my hair, I stroked my hands through the roots and over my scalp. Usually, my hand would get entangled in my hair strands, and my fingers would carry some sort of an oily trace. My hair felt cleaner, softer, and was easy to brush afterwards. And my hair definitely felt light on my scalp, without weighing down on it. Overall, I am happy with the results and would highly recommend you try this once. It worked for me and I can’t see why it won’t work for you. P.S: While the shampoo gave me good results, I would not use it more often. I have had some bad results with good shampoos whenever I overdid it, so I will just follow the recommended directions and stick to the routine. That is the best way to get good results with the cleanser. The Indulekha cleanser works for me and looks good to give better results over consistent use. Well, I use bringha hair oil from Indulekha before shampooing but a pure argan oil or a good cold pressed oil would do just fine. Having said that, take my advice with a pinch of salt. Do your own research, as always. I mean, try it a for a couple of weeks to see if it suits your hair type, and continue using it if there’s any noticeable improvement in your hair. Let’s face it. There are no magic hair care products that can stop hair loss or prevent alopecia, regardless of the bold claims that advertising makes. But there are a few good ones out there. So don’t spend your money on products that hardly work. Hi I’m using indulekha shampoo only but heavy hair fall..I fellin very bad..
That is not a good experience. It would be great if you can add details about your hair type, shampooing routine etc . Hair fall is tricky and I’d urge you to look into the root cause of the problem before it aggravates. Studies claim that hair fall can happen due to many reasons. Some include scalp health, dandruff, deficient diet, use of products with unwanted chemicals, and, more importantly, stress. If you have oily hair, don’t apply oil otherwise your hair fall will worsen. Find a non-oily herbal hair lotion and apply it on your scalp daily. However, you can apply virgin coconut oil or pure olive oil once a week. Avoid massaging our scalp aggressively. Hair loss indicates weak roots and massaging may make it worse. Keep a watch on your diet. Check with your doctor and ask them to order vitamin and mineral supplements if needed. Times in a week. Hair s dry. What can next step. I too use this shampoo very very bad my hair thick and long .but now very very thin .one lac hair loss per a time .plz don’t buy this shampoo very bad.